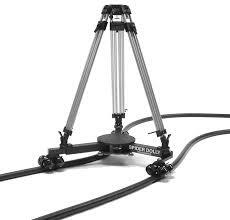 This amazing seamless dolly track can be configured in straight runs or can curve in any radius or direction. The basic unit is 40', which will loop to make one 17' run. 2 pieces side by side will create a 40' run. Each section rolls up into a 2' diameter bundle and weighs 30 lbs. creating unprecedented portability for a track rigid enough to support an operator, yet flexible enough to curve into a 90 degree turn with a 2' radius. FlexTrak has all of the advantages of the original, but is now even better in three ways a 40' (12m) piece is 10 lbs. lighter, now weighing only 30 lbs. (13.6 kg), and therefore when in a carrying case will still be under the 50 lb. weight restriction for airline travel. Retains little or no memory from being stored in a coiled position. Is not very temperature sensitive. The original FlexTrak worked best at room temperature or above.